What is your Axial Load Capability? What Type of Screws does Climax Use in its Products? What Materials does Climax use to Manufacture its Products? Want to learn a little more about Shaft Collars? View the following presentation outlining the different shaft collar types, materials used, and applications shaft collars are commonly found in. 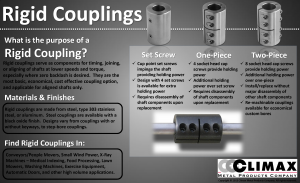 Want to learn a little more about Rigid Couplings? View the following presentation outlining the different rigid coupling types, materials used, and applications rigid couplings are commonly found in. Shaft Couplings serve as components to time, join, or align shafts at lower speeds and torque, especially when zero backlash is desired. They are not intended for use as a critical part of a drive line or as a substitute for flexible or universal joints or other power transmission devices. Rigid couplings are designed for aligned shafts only, and are the most basic but often the most cost-effective coupling. What is a Shaft Collar? Want to learn a little more about Keyless Locking Devices? View the following presentation outlining what a Keyless Locking Device is, how it works, and how a KLD can provide the solution for your toughest problem. What type of shaft collars does Climax manufacturer? 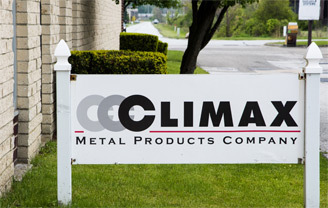 Climax manufactures set screw collars and clamping collars. We also customize dimensions, add keyways, offer balanced collars, provide specialized plating, and manufacture from a variety of materials. What materials are used in manufacturing Climax Shaft Collars? Steel Collars are the most commonly used and manufactured. The exact type of steel used varies depending on the machine process but generally low-carbon steel is used, including materials such as 12L14, 1215, and 1026. Since 1946, Climax Metal Products Company has grown into the leading source for engineered shaft locking solutions by providing outstanding customer service. Climax Shaft Collars, Rigid Couplings, and Keyless Locking Devices are manufactured with unsurpassed quality and stocked by distributors throughout North America.